Carl Jung, a famous twentieth-century psychologist, was the first to introduce the terms “introvert” and “extrovert” to describe the ways various people interact with the outside world. “Introverts are drawn to the inner world of thoughts and feelings, while their opposites, extroverts, crave the external world of people and activities.” Most people are not extreme introverts or extroverts, but instead fall somewhere on a spectrum, leaning more to one side than another. 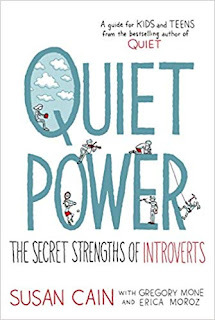 In recent years, Susan Cain, founder of The Quiet Revolution (quietrev.com) has done much to help introverts make the most of their personality traits in the world and to help extroverts understand where introverts are coming from. Cain’s book Quiet Power: The Secret Strengths of Introverts is designed to help introverted teenagers understand the good things about being introverts as well as to help them function well in society. Cain offers solid practical advice on surviving and thriving in school, coping with group projects, making friends, and pursuing their passions. Quiet Power is an excellent resource for introverted teens as well as their parents and teachers. Introverts and extroverts have much to offer each other and society at large. Communities, whether they be families, schools, or workplaces function better when both groups are understood, supported, and encouraged. This looks interesting! Thanks for posting!